Koch BioMax HEPA Commercial Filters are used in filter applications for hospitals, data centers, nuclear facilities, pharmaceuticals, laboratories, aerospace, food processing and optics. The Commercial HEPA Filter Replacement 24"x24"x11.5" Standard Capacity is the correct replacement for the Koch BioMax H66A1X2. The Commercial HEPA Filter Replacement 23-3/8" x 11-3/8" x 11-1/2" High Capacity is the correct replacement for the Koch BioMax H60A2X1 HC. The Commercial HEPA Filter Replacement 23-3/8" x 11-3/8" x 11-1/2" Standard Capacity is the correct replacement for the Koch BioMax 231111 SC. The Commercial HEPA Filter Replacement 23-3/8" x 23-3/8" x 11-1/2" High Capacity is the correct replacement for the Koch BioMax H64A4X2. 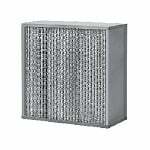 The Commercial HEPA Filter Replacement 24"x24"x11.5" High Capacity is the correct replacement for the Koch BioMax H62A4X2. The Commercial HEPA Filter Replacement 24"x24"x11.5" Standard Capacity is the correct replacement for the Koch BioMax H62A3X2. The Commercial HEPA Filter Replacement 24"x24"x11.5" Standard Capacity is the correct replacement for the Koch BioMax H66A3X2. The Commercial HEPA Filter Replacement 24"x24"x11.5" High Capacity is the correct replacement for the Koch BioMax H66A4X2. The Commercial HEPA Filter Replacement 23.3" x 11.3" x 11.5" High Capacity is the correct replacement for the Koch BioMax H60G2X1 filter. The Commercial HEPA Filter Replacement 23.3" x 11.3" x 11.5" Standard Capacity is the correct replacement for the Koch BioMax H64A2X1. The Commercial HEPA Filter Replacement 23-3/8" x 23-3/8" x 11-1/2" High Capacity is the correct replacement for the Koch BioMax H64A2X2. The Commercial HEPA Filter Replacement 23-3/8" x 23-3/8" x 11-1/2" Standard Capacity is the correct replacement for the Koch BioMax H64A1X2. The Commercial HEPA Filter Replacement 24"x12"x11.5" High Capacity is the correct replacement for the Koch BioMax H62A2X2. The Commercial HEPA Filter Replacement 24"x24"x11.5" Standard Capacity is the correct replacement for the Koch Biomax H62A1X2. The Commercial HEPA Filter Replacement 24"x24"x11.5" High Capacity is the correct compatible replacement for the Koch BioMax H66A2X2.